Yep. I’ve got 18 seasons of World Cup, Olympic and World Championship alpine results. Not nearly as extensive as my XC results, but it’s interesting data nonetheless. As with any new set of data, you spend a bit of time just poking around looking at stuff. Today I’m going to share something that I thought was rather odd, but that could be because my experience with alpine racing is, shall we say, limited. Don’t worry, I’m going to show you a second version that’s zoomed in on the area of interest. But first, let’s discuss all these outliers that are throwing the scale of the plot off. I am unsurprised that there are some extremely slow times here. Alpine skiers will sometimes stumble, miss a gate or something and proceed to hike back up the hill to get around the gate they missed, although I am told that this is very rare at this level. And indeed only ~1.5% of these results seem like they could plausibly be connected to someone having to hike. 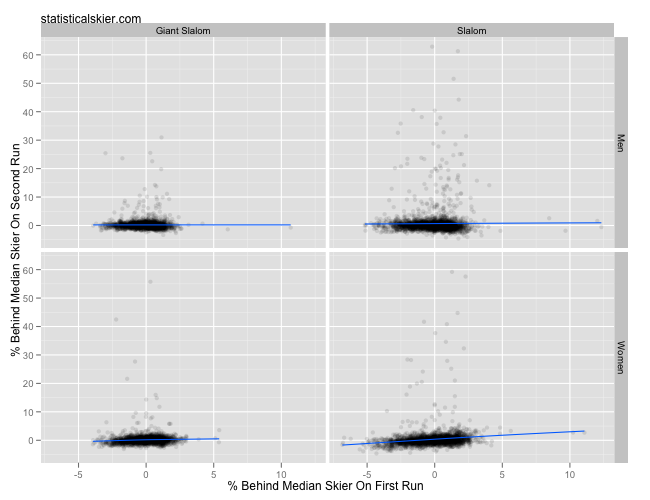 But why are these outliers disproportionately occurring on the second run? Again, as far as I know, only the top 30 skiers or so from the first run advance to do the second run. So if you screw up on the first run, there’s literally no point in hiking, while if you screw up on the second run, hiking and finishing would at least be better than being disqualified. While looking at the first plot, above, I didn’t think much about the presence/absence of a correlation, since it was so hard to tell given the scale problems. 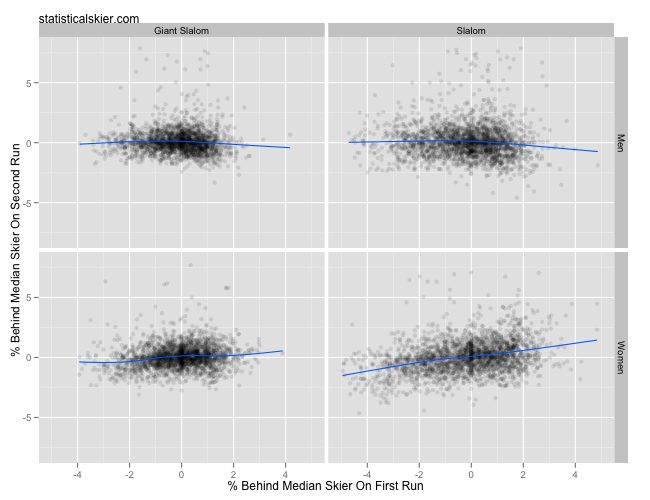 There appears to be a slight correlation in the women’s slalom races, but not elsewhere. The fact that the start order for the second run is reversed may be “evening things out”. The fast skiers start first on the 1st run, but then they reverse that ordering on the second run. The course conditions can change dramatically as the race progresses, and I’m told generally gets slower as more people ski on it. So maybe the fast skiers on the first run are then being penalized slightly on the second run. Tactics. Maybe the top skiers are likely to ski more conservatively to avoid crashing on the 2nd run, if they had a very fast 1st run, and vice versa. If you just squeaked into qualifying for the 2nd run, you may have ‘nothing to lose’. The inherent unpredictability of hurtling down an icy mountain at 60mph. Insanely small things probably separate 1st from 15th in WC alpine races, so maybe ‘luck’ is playing a role. And I’m not saying that the winners are ‘just lucky’, I’m saying that the margins between these folks are so small that any amount of luck or chance will have a huge impact on their results. Posted by Joran on Friday, October 14, 2011, at 6:00 am. Filed under Alpine. Tagged alpine, World Cup. Follow any responses to this post with its comments RSS feed. You can post a comment or trackback from your blog.